For fine dining, duty-free shopping and lavish hotels mixed with pristine ocean and paradise beaches, a St. Barts honeymoon is absolutely ideal. Saint Barthelemy, also known as St. Barts, mixes the azure Caribbean ocean and white sandy beaches with Parisienne elegance and exclusivity that make it a favorite with the rich and famous—and St. Barts honeymoons are certainly popular as well. Perhaps the most well-known hotel is the Eden Roc and if your budget stretches to the exclusive Greta Garbot Suite with its private terraces, mosaic floors and old-school glamour, you won’t be disappointed. For the utmost in service and ultra-luxury, try the all-villa Le Toiny hotel and wake up to having breakfast served on your terrace next to your private pool. It is also home to one of the island’s best restaurants (Le Gaïac) and foodies will love the quality and diversity of food on offer. 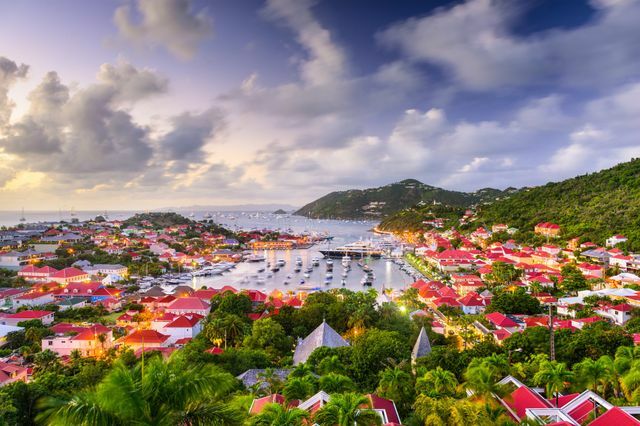 St Barts is well known for its passion for fine dining with French and Creole cuisine as its specialty. Spend your days on secluded beaches, surfing the Atlantic or swimming in the serene, calm waters of the Caribbean. There are over 20 to choose from. After a day on the beach and an evening watching the sunset over fine wine & fresh fish, it’s time to join the glitterati and dance until the sun comes up. If you’re looking for adventure, there is ample opportunity for kite-surfing, wreck diving, surfing and sailing. History buffs will also enjoy the chance to discover St Barts colorful heritage at a variety of museums, churches and ruins. A St. Barts honeymoon is sure to be memorable. Check out these tips for planning your trip of a lifetime! St Barts has a tropical climate which means its summers (August-November) can see a lot of rain falling in sharp afternoon showers. December is very busy with prices at a premium and a need to book 6 months in advance. January to April is very hot and a great time to visit but prices are high especially during boating week in March. You’ll find the best room rates for your St. Barts honeymoon from April to mid November with May and June a great option for warm weather and lower prices. Hit the shops: St Barts is a duty free port that offers everything from roadside handicrafts to Parisienne style designer boutiques so head to Gustavia or St Jean—ideal for couples who want to their St. Barts honeymoon to include some retail therapy. Visit one of the best beaches in the world: Always a feature on top 10 beaches lists is the Grande Cul De Sac with it’s still calm waters, protected by the reef that make it perfect for kayaking and watching the pelicans. Bikini Brunch at La Plage: Visit this super-hip restaurant and bar with incredible views and sandy floors anytime—on Saturday afternoons, it’s the place to be seen. Go diving: Divers at the Nature Reserve of Saint Barthelemy will have the chance to spot turtles, reef sharks and spotted eagle rays. Visit Corossol: This tiny fishing village is home to handicraft stalls where women, dressed in traditional clothes and speaking a norman dialect, make crafts from straw. Take in the view: With spectacular views everywhere on this stunning island, it can be hard to choose but we recommend the short walk up hill from Fort Gustav for an amazing view of Shell Beach. Learn about St Barth’s mixed heritage: Originally leased to Sweden and then a French commune, learn more at Musee Territorial and Wall House Museum in Gustavia. Have a picnic: Pack up a picnic with goods from Maya’s To Go and head to the secluded Le Colombier beach which can only be reached by a 25 minute hike or by boat. Ideal if you want to enjoy some relaxation and seclusion during your St. Barts honeymoon. Sail away on a VIP yacht: For the utmost in indulgence and absolute privacy, hire a yacht for the day where the crew will show you the island and take you to secluded beaches and coves.